Tip: for best results, solve puzzle on this page on a desktop computer or laptop. 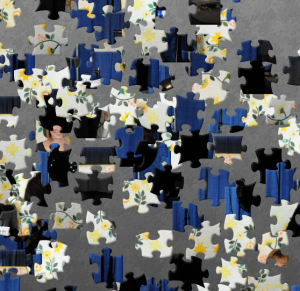 If you are solving on a mobile device, click on the puzzle piece icon in the lower righthand corner to solve on the Jigsaw Planet website. Welcome to another quilt jigsaw puzzle from Quilt Alliance! This month, we’ve got a new challenge for you! See below for clues. Be sure to sign up for our blog notifications, so that you don’t miss any of the upcoming puzzles. This week’s puzzle spotlights a quiltmaker who was interviewed for our Quilters’ S.O.S. – Save Our Stories oral history project on November 5, 2011. Think you know who the mystery QSOS Interviewee is? Now solve the puzzle to see if you’re right!